This final chapter is devoted to the modeling and filtering of noisy signals by seeking optimum estimators in the least squares sense. 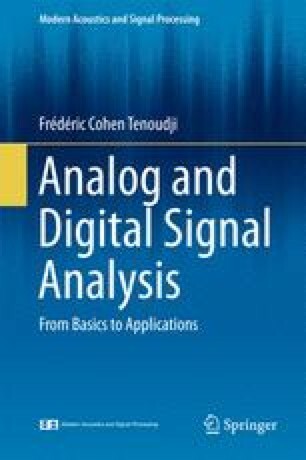 The basics of this analysis were laid by N. Wiener for wide-sense stationary signals. The first example is given about the use of a Wiener filter, providing the estimate of a random signal from the measurement of a second random signal which is correlated to it. The search for a filter in the form of a FIR filter requires the resolution of the Wiener–Hopf linear system of equations. A second important application is the prediction of the value of a signal from the previous measurements on a finite number of points. In the case of finding an IIR Wiener filter, two different situations arise. In the case of looking for a non-causal filter, the resolution is easy by processing in the Fourier domain. In the search for a more realistic causal filter, treatment is more difficult and requires the factorization of the z-spectral density which is difficult to carry out in practice. Kalman brought a breakthrough to this problem by searching recursively for the estimator. This formulation allows the treatment of non-stationary signals, and the recursive nature of the calculations allows for quick calculations. The applications are countless, in control systems and in defense industry. We only focus here on the principle of the filter and its application to simple cases.